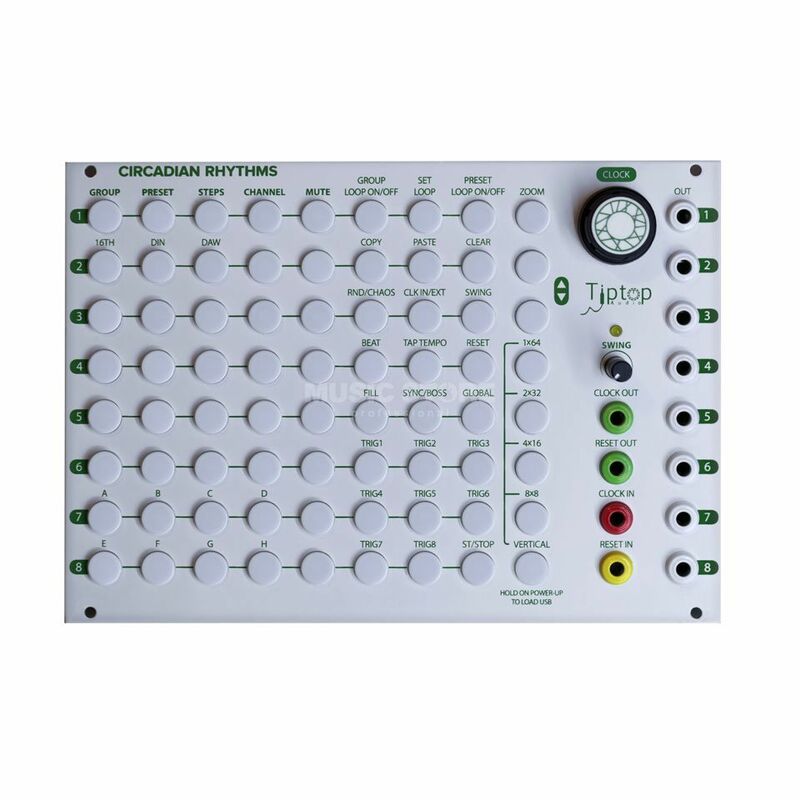 Tiptop Audio Circadian Rhythms is a modular synthesizer sequencer module in Eurorack format, designed with the needs of professional musicians and composers in mind: from the powerful, precise sequencer engine with excellent groove, to the use of internal functions that are easy to use and automatically balance performance, to astonishingly low power consumption, saving the power supply stress. Experienced sequencer users will immediately notice that this machine exactly meets their needs, while newcomers are equally attracted by the gallant operation for programming their performances. Unlike traditional hardware sequencers with only one static display, Circadian Rhythms offers four different horizontal and two unique vertical views, which are resolved from micro to macro, instantly switching between a full 64 step view of a track, or a simultaneous view of all eight channels in which the tracks run side by side. Stretch gate signals across multiple patterns to approach envelopes, or use the zoom view to shift single punches by a few milliseconds - all from the same interface. Patterns and musical phrases are quickly and intuitively repeated, looped, chained, muted and manipulated thanks to the clearly structured panel layout. Numerous multicolor LED´s impressively illustrate the programmed music. No less than 72 pressure switches with multi-color illumination form the 8 x 9 grid, allowing Circadian Rhythms to precisely visualize both notes and data. It only takes one click to switch between horizontal and vertical view, turning the grid into a programming matrix for Mutes, Loops, Swing, Fills, Copy and Paste, Grouping, Randomizing, Manual Triggering and much more. Activating these functions is always only one, maximum two push-button operations away. For the ultimate groove, an extremely precise clock with jitter and latency measurements in the microsecond range works inside the CR. The four different Clock-Sync modes make the connection with modules, hardware and software much easier: Circadian Rhythms generates precise clock and reset signals for all other sequencers and devices in the system and beyond! Whether a huge Eurorack system, or synchronized to a DAW, the groove always remains tight. The SyncBus developed by Tiptop Audio enables perfect synchronization of linked devices with SyncBus technology. A SyncBus Master feeds its clock and its switching status directly to the devices connected in the chain, so that they all work together as if it were a device. Use two CR´s to make a sequencer with 16 channels, or add one to three triggers Riot´s to open up more levels for experiments. And best of all: the devices are connected behind the control panel, so no cables have to be patched to ensure that the devices run synchronously.